This document is a technical summary of a workshop held at the Turner-Fairbank Highway Research Center on the extended use of high-performance materials on highway structures. environmental concerns, the extended use of HPMs to other elements of the highway system, specifically substructures, foundations, and retaining structures, warrants investigation. 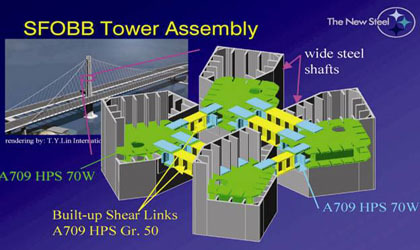 On August 28 and 29, 2006, a workshop was held at TFHRC on the application of HPMs to the design and construction of substructures, foundations, and retaining systems. The purpose of the workshop was to identify pertinent HPMs, discuss the pros and cons of applicability, and develop a plan to address the research and implementation issues. The attendees included representatives from the construction industry, academia, professional organizations, the Transportation Research Board (TRB), and the Federal Highway Administration (FHWA), as listed below. George Goble, Bridge Diagnostic, Inc.
Sanjeev Kumar, Southern Illinois University Carbondale. John Turner, University of Wyoming. Resistance to high construction stresses, hydration temperatures, and other construction/fabrication processes without detriment. High strength to weight ratio (allows easier, faster, and cheaper handling). Rapid construction needs (by being installed, fabricated, or deployed rapidly without detriment). Increased tensile strength (minimizes handling and driving problems for concrete piles). Long duration flow characteristics for concrete (8+ hours). Rapid placement of concrete for large diameter drilled shafts through multitremie pumping. Sustainability. Will not deteriorate with time. Delayed ettringite formation (DEF) (elimination or reduction of DEF may reduce the risk of secondary forms of deterioration such as freeze/thaw attack or reinforcement corrosion). Environmentally inert. Will not leach detrimental materials out or let detrimental materials in. High early strength. Has great application to rapid construction goals particularly for driven concrete piles. Uniformity of high performance materials. Consistent reproducibility from specs of above properties. Full confidence in uniformity of properties will speed up construction process by reducing QA testing and reduce costs through reduced need to compensate in design for statistical variability of properties. Damage tolerance. Maintains noncatastrophic failure modes. Smart properties. Includes self-sensing of condition and automatic notification, as needed, and self healing. High-strength concrete (greater than 10,000 psi). Concrete utilizing bottom ash, slag, and other boiler waste materials instead of natural aggregates. Micro/nanofiber reinforced concrete and derivatives. High-performance fiber reinforced cementitious concrete (HPFRCC). 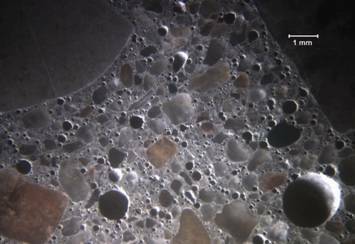 Slurry infiltrated fiber concrete (SIFCON). Slurry infiltrated mat concrete (SIMCON). Possibly can use self-stressing properties to prestress anchors and nails. Ductile fiber reinforced cementitious concrete (DFRCC). High-strengthsteel (greater than 70,000 psi). Fiber reinforced polymer (FRP) and carbon fiber reinforced polymer (CFRP). Concrete piles. Reduce or eliminate reinforcement, reduce amount of material, increase ductility and durability, and reduce maintenance. Drilled shafts. Provide all of the above, as well as reduce mass concrete effects and improve constructability. Voided/hollow drilled shafts. Eliminate material and eliminate mass effects. Shallow foundations/caps. Use CFRP reinforcement, has high strength steel and yield thinner foundations with smaller footprint. Hybrid drilled shaft/micropile. Use high-strength steel tendons instead of rock socketing. Earth retaining systems. Use high-performance soil nails, tendons, anchors, etc. The pros and cons and value proposition of the potential applications were discussed, and as a result, the following research projects were suggested. Establishment of repeatable mix designs based on performance specifications. Behavior of enhanced piles under lateral impact loads, i.e., ship impact, debris, ice flows, flooding, hurricanes, etc. Identification and mitigation of potential production problems. The objective of this study is to produce high tensile strength and ductile concrete piles with minimum or no reinforcement that exhibit superior durability for severe environments. technologies that are necessary to produce the desired end product will be investigated, the technical and economic feasibility and implementation impediments will be identified, and solutions will be tendered. Materials and technologies selected for further study will be investigated through analytical, laboratory, and field studies to optimize the fabrication, engineering performance, and cost. Full-scale field testing will include instrumentation to evaluate driveability, load transfer behavior, in situ durability, and other environmental issues. that will permit a significant reduction or elimination of steel reinforcing and/or a reduction in concrete, thereby yielding significant savings in construction costs. Figure 1. High-performance concrete piles. While self-compacting concrete (SCC) (see figure 2) has long been used under different names, a lack of a performance classification system has hampered communication between designers, contractors, and concrete suppliers, often resulting in designs not compatible with construction methods. This study will greatly improve communications among all parties involved by developing systematic standards and tests to quantify critical design parameters. To use current mechanical properties performance grades. To develop fresh properties performance specifications for batching grades and placement. To develop performance specs for mass concrete to lower heat of hydration of large diameter shafts. Recommendations for performance grade concrete. Figure 2. Performance-based characteristics for self-compacting concrete drilled shafts. Drilled shafts often are socketed into rock to provide adequate bearing and lateral load capacity. Typically, the hole is advanced to the rock layer, and then 3.05 m (10 ft) or more of strong rock is excavated to achieve a full moment structural connection between the shaft and the rock. Thus, a situation is created where highly competent rock (sometimes 20,000 psi or greater) is replaced with less competent material (4,000 psi concrete) at a great expenditure of cost and time. 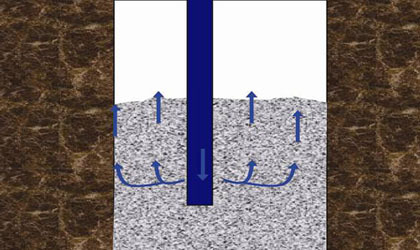 Through the use of high-performance steel and concrete, a hybrid shaft consisting of high-strength tendons or micropiles installed at the rock face to the required depth could be utilized, resulting in shafts being built faster at less cost and with reduced risk of delays or claims (see figure 3). To produce full structural capacity of a rock socketed drilled shaft with increased constructability, flexural capacity, and ductility. To minimize risk of delays and cost overruns. Analytical studies will be completed to theoretically support the concept. Small-scale lab tests will be conducted to verify the analytical predictions, followed by a smaller number of large-scale model tests. Experimental field studies at one or more shallow rock sites will be performed to include dynamic lateral and axial load testing. The products of this study will include design and construction guidelines for a drilled shaft hybrid for rock socket applications. Figure 3. Hybrid shaft consisting of high-strength tendons or micropiles installed at the rock face. The protection of steel reinforcement in soil anchors, nails, micropiles, and other foundation types (see figure 4) is a major concern from both a cost and durability standpoint. Nonmetallic reinforcements could provide an economical solution. The objective of this study is to identify and select anchored geosupport systems that incorporate nonmetallic reinforcing materials with performance characteristics equal to or greater than steel. This study will evaluate various nonmetallic systems for use as high-strength tendons and high-strength bars. Geosupport systems utilizing high-performance composite materials are well developed in other countries such as Japan; therefore, this study will also include a review of Japanese experience on projects involving slope stabilization, temp-rary shoring, bridge anchorage, permanent retaining walls, and others. Research will also explore other fields that use geosupport systems, such as aerospace, defense, medical, marine, etc. The anticipated products for this study will be a feasibility report documenting promising systems and recommendations for further study. Figure 4. 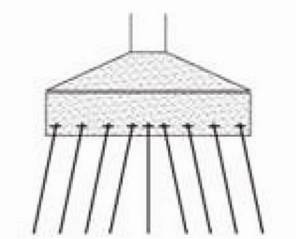 Soil anchors, nails, and other foundation types that require protection of steel reinforcement. The coastal areas of the United States are a particularly hard environment for substructures and foundations, resulting in hundreds of millions of dollars spent each year on maintenance and new construction to correct the corrosion and deterioration from environmental conditions. Thus, finding an inexpensive solution to this problem will save millions of dollars in affected States. 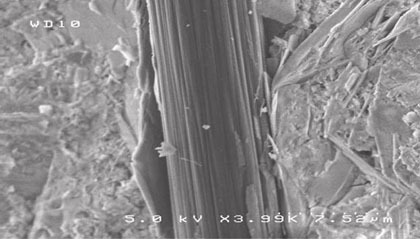 Composite cement-based materials including but not limited to micro/nanofiber reinforced cement-based materials (see figure 5) provide an effective alternative for amelioration, protection, and deterioration prevention of civil infrastructure because of their demonstrated resistance to corrosion and control of crack propagation. They have the potential to lower the total life-cycle cost of the application. The objective of this study is to develop cost-effective modified cementitious materials that will yield performance-specific properties for substructures, foundations, and retaining systems with superior durability in severe geotechnical environments. A review of current research will be performed to identify materials that are pertinent to the study's objective. Selected materials will be subjected to laboratory studies to simulate environmental conditions and evaluate the long-term material durability performance. Field studies will be conducted in aggressive environments and compared with the laboratory studies. The anticipated products of this study will include new cost-effective composite cement-based materials with documented enhanced durability characteristics. Figure 5. 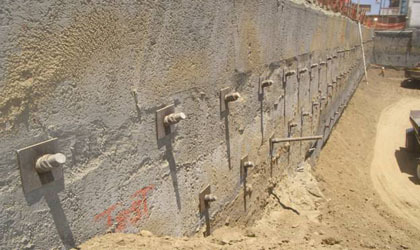 Cost-effective modified concrete for aggressive geotechnical environments. A common procedure used by many State transportation departments is to specify permanent steel casing for portions of drilled shafts that are potentially subject to exposure by scour. However, the additional structural resistance provided by the steel casing is often neglected in design. 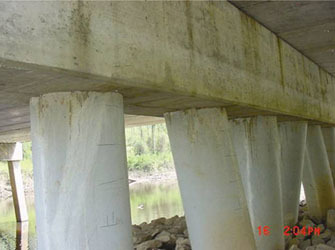 Nevertheless, there are many performance-based reasons for applying steel casing on drilled shafts and bridges, including better concrete confinement, improved ductility, higher structural capacity, as well as possibly more rapid construction by allowing for integral construction of foundations and columns (see figure 6). An additional advantage may be cage reinforcement reduction, preventing overly congested shafts, which have been a constructability problem in seismic designs. Several issues need to be addressed to provide design engineers with a suitable approach. These include (a) applicable analytical models that account for axial, flexural, and shear resistance of reinforced concrete shafts completely or partially enclosed in steel casing; (b) experimental verification of composite action; (c) cost issues associated with the use of high-strength steel as permanent casing; and (d) constructability of drilled shafts with permanent casing. 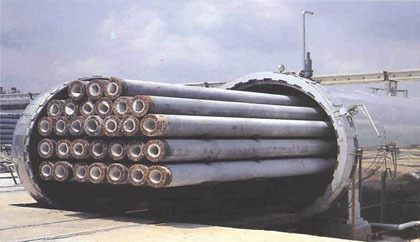 steel casing into design and construction of drilled shafts for highway bridge structures. To propose design procedures for incorporation into the American Association of State Highway and Transportation Officials Load and Resistance Factor Design (AASHTO LRFD) Bridge Design Specifications. Existing analytical models will be reviewed and assessed for applicability to drilled shafts with permanent casing. For example, CalTrans, the California Department of Transportation, currently uses a type of deep foundation referred to as cast-in-steel-shell (CISS) pile. The pile is constructed by driving a steel pipe using conventional pile driving methods. The inside of the pipe is excavated and filled with reinforced concrete. Also, steel-encased reinforced concrete columns are common in seismic areas for their higher ductility and concrete confinement characteristics. A field load testing program will be carried out on instrumented drilled shafts to verify analytical models and to evaluate the effects of concrete-to-steel bonding on shear and flexural response (composite action). The practical and engineering aspects of utilizing high-performance steel as permanent casing, including costs, corrosion issues, and integral construction of drilled shafts and superstructure columns, will be evaluated. The product of this study will include a standardized method for inclusion in AASHTO LRFD Bridge Design Specifications that allows design engineers to account for permanent steel casing and its effect on foundation capacity, load-displacement response, and superstructure response. Figure 6. High-performance steel as permanent casing for drilled shaft foundations. Recent research on the use of FRP composite piles and recycled plastic for highway substructures revealed that recycled plastic piles are not suitable for heavily loaded highway substructures. While FRP concrete filled shells (see figure 7) were found more than adequate for lightly loaded structures, some questions remain as to their use for more heavily loaded structures without adequate steel reinforcement. Thus, CFRP shells, which are stronger than steel, may be viable if an economical design (considering installed and long-term costs) can be developed. Analytical studies for structural and driving performance will be completed. Based on the analytical studies, shell manufacturers will be solicited to provide shells designed to specification. Prototype piles will be fabricated from shells filled with concrete prior to driving and from shells driven first then filled with concrete. It is anticipated that the driving and testing evaluation will be completed on U.S. Department of Transportation (DOT) projects. Figure 7. Fiber reinforced polymer concrete filled shells used for lightly loaded structures. There is an under utilization of industrial byproducts to develop high-performance concrete. The objective of this study is to maximize the use of bottom ash and other byproducts when developing high-performance concrete designs (see figure 8) to minimize costs. writing standard specs for using waste materials, etc. Figure 8. Recycled materials and industrial byproducts in high-performance concrete designs. High-strength steel piles (greater than 70 ksi) were also discussed. The consensus of the workgroup was that there are no impediments to use other than designer awareness and possible limitations of available installation systems. Other topics not discussed in the workshop but that were suggested by stakeholders and FHWA Resource Center personnel included the use of tire bales. Tire bales are a new and very promising technology for the use of scrap tires as fill materials in civil engineering applications (see figure 9). Around 100 whole tires are mechanically compressed and then tied to form large "bales" that could be easily transported and stacked to form a fill material. Major properties of tire bales are light weight (40 pcf), permeability, and low cost. This application was thoroughly investigated in a recent Colorado Department of Transportation (CDOT) research study and was found to offer a viable cost-effective alternative to conventional soil fill material and lightweight fills (including tire derived aggregate (TDA) and geofoam). Detailed recommendations for development of design and construction specifications for the use of tire bales in embankments were furnished in CDOT Research Report 2005-2, entitled "Tire Bales in Highway Applications: Feasibility and Properties Evaluation." Figure 9. Application of tire bales. For more information about this research, contact Mike Adams, HRDI-06 at (202) 493-3025, mike.adams@fhwa.dot.gov. Availability—This TechBrief may be obtained from the FHWA Product Distribution Center by e-mail to report.center@fhwa.dot.gov, fax to (301) 577-1421, phone to (301) 577-0818, or online at https://www.fhwa.dot.gov/research/topics/safety/intersections/index.cfm. Key Words—High-Performance Materials, Substructures, Foundations, and Earth Retaining Systems.